Laurie Rocco is an Inspector of Pesticides for the Massachusetts Department of Agricultural Resources and a Public Fire and Life Safety Educator for the Palmer Fire Department. 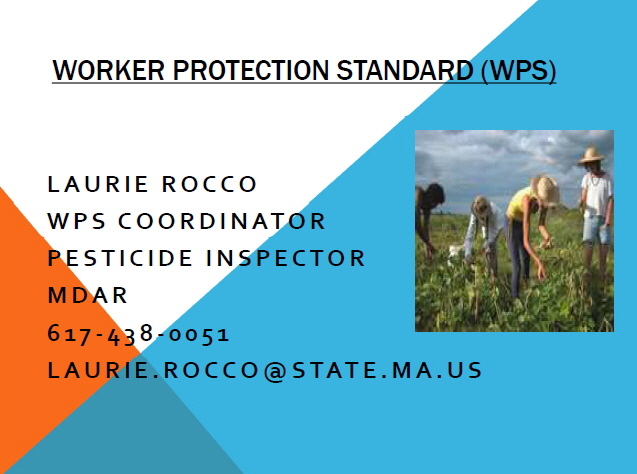 On Saturday, August 26, 2017 at MCTA's 59th Annual Meeting held at Mistletoe Acres Tree Farm in East Bridgewater, MA, Laurie gave a PowerPoint presentation on Worker Protection Standards (WPS). She reviewed the 2017 WPS and its application to both licensed and unlicensed operators. She elaborated on what to expect when selected for a field audit, record keeping requirements, training requirements for farm workers and PPE issues, and changes to the new respiratory regulations. Helpful information was given on what you need to do to comply. Click on either of the links below to view Laurie's PowerPoint presentation.